When the recipe said quick and easy, I was sold. I made it the day I saw the recipe - now that is some advertising! Sometimes you just need something sweet, and after a long hiatus of not baking, I needed something to ease me into the process. 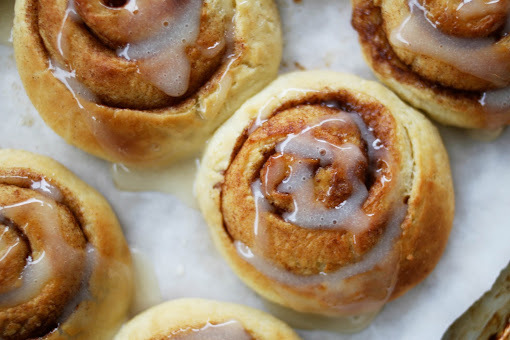 Even though yeast can be scary, these are anything but! Whisk together the water, yeast and 1 tsp. sugar in a large mixing bowl; allow to sit for 5 minutes. Stir in the remaining sugar, egg, 1/3 cup sour cream, 1 tbsn. melted butter, baking powder and salt until well combined. Stir in the flour until well combined and a ball of dough forms. Lightly cover the bowl with a moist towel or saran wrap and allow the dough to rise in a warm area for 45 minutes. Roll the dough out into a thin rectangle on a floured surface, using a floured rolling pin. Brush the dough with 1 tbsn. melted butter, then sprinkle the entire surface with brown sugar and cinnamon. 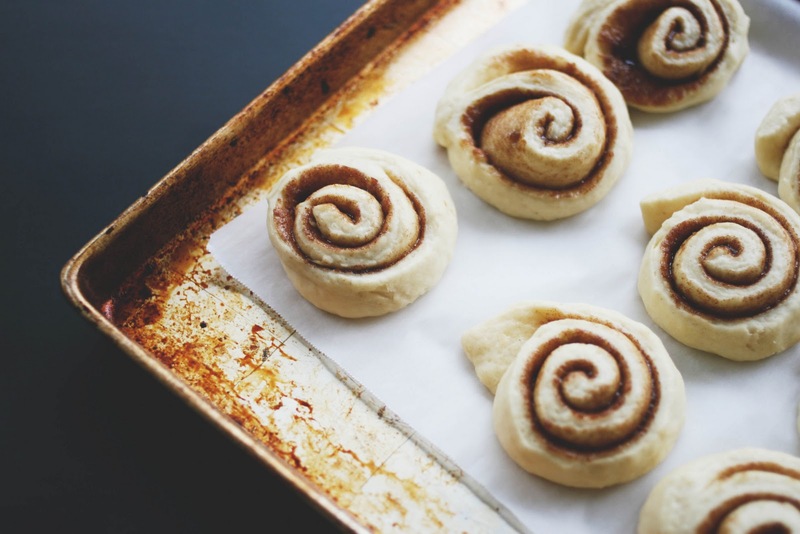 Roll the dough up and slice into 12 equal pieces. Place on a parchment paper lined baking sheet and lightly cover with a moist towel or saran wrap. Allow to rise in a warm place for 30 minutes. 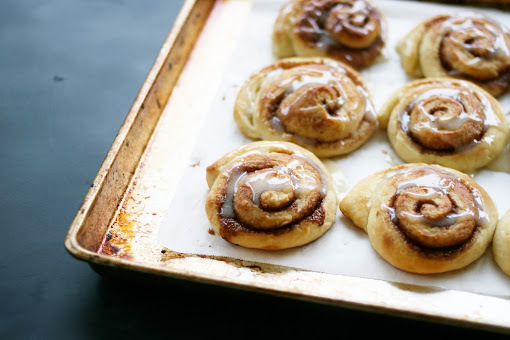 Once risen, heat the oven to 350 F. Brush the cinnamon rolls with the remaining 1/2 tbsn. melted butter and bake for 15 - 20 minutes until golden brown. Transfer to a wire rack to cool. To make the glaze, mix together the remaining sour cream, powdered sugar and vanilla until smooth. Drizzle over the cooled cinnamon rolls. You know, sometimes we don't need the *best* this or that... there are definitely times when instant gratification is necessary! These look like they come together in a flash, which is perfect for those times you need to whip something up for friends... or to satisfy a craving. Yum! Wow. I want those so bad right now!! Yummm. These look super yumm and so easy to whip up! Definitely listed on my to-do list next weekend. Thanks for sharing! Beautiful rolls. Perfect for sunday morning!